The Fusil Mle 1866 "Chassepôt"
The Prussian military adopted a breach loading rifle, the leichtes Perkussionsgewehr Model 1841, more commonly called the Dreyse Needlegun, and equipped all of their infantry units with it in the 1840s. The rifle was a European attempt to produce a weapon more effective than the American M1819 Hall breachloader. The weapon introduced a lugged bolt action that forced the weapon's bolt firmly against the bore, creating a limited gas seal. Compared to muzzle loading rifles at the time the Dreyse was much faster to reload, but like the Hall leaking gas limited the power of the shell. The leaking gas required a very large powder charge and a 18mm large bore to come close to the effectiveness of muzzle loaders, and this limited the ammunition loads carried by soldiers, but the limited ammunition was also a blessing - the Dreyse quickly fouled, tended to burn the shooter in aimed fire, and the needle fire design was fragile and only good for a few hundred shots. The problems with the Dreyse and the small role Prussia played on the international stage initially kept other nations from adopting breachloaders, but in the 1860s it became apparent to France, whose observers were following the Civil War in the United States, that muzzle loaders had reached the limit of their practical improvement. Adopting a breechloader became a high priority for the French army. In 1863 a Parisian civil servant Antoine Alphonse Chassepôt offered his recent invention, a bolt action breech loading rifle, to the French military establishment. The rifle had a rotary bolt that locked into the receiver just as the Dreyse, and it fired a paper wrapped cartridge (1) that was ignited by a reversed percussion cap punched by a firing pin. The key innovation of the Chassepôt rifle was a rubber ring that was compressed by closing the bolt, creating a strong gas seal. Compared to the Dreyse and the French Tabatière rifle the Chassepôt had a longer range, was safer to shoot, and could be fired from the shoulder. The rubber ring was relatively fragile - it would sometimes become unusable in under two-hundred shots, but it was cheap and easy to produce, and could be replaced in less than a minute. Prior to the introduction of copper and brass cartridges the rubber gas seal was the only good way to seal the chamber and prevent the escape of gasses, reducing the weapon's effectiveness. Compared to the Hall rifle and the Dreyse, the Chassepôt was easier to fire, safer to use, fired a bullet at a higher muzzle velocity using less powder, and it was, as will be seen, able to easily converted to fire metal cartridges. Many other breech loaders lacked the strength to handle metalic cartridges in military service. The Chassepôt fired an 11mm conical lead round wrapped with a grease impregnated paper patch which is inserted into a tube of gun paper. Powder fills the paper tube, and a reversed firing cap is wrapped in the back of the glued base. Unlike earlier weapons the paper wrapped cartridge did not need to be bitten open to remove its contents for firing. The Chassepôt round was complete. As the picture shows the round was inserted into the breach of the rifle and the bolt closed. The bolt formed a gas tight seal as its rubber gasket expanded to fill the breach. 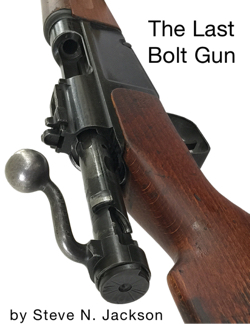 When the trigger was pulled a need was driven by the cocking peice on the bolt to penetrate the firing cap, firing the cartridge. Most of the paper and the cap were expelled by the chamber pressure, and premature detonations from ignited paper remaining in the breach was never a problem. The round, though coming after some nations had adopted metalic cartridges, also had the charm of being cheap, using much of the loading tools used to make paper cartridges for breach loaders and capable of being made by newly opening machine-made cigarrette and cigar factories. In 1866 the rifle was put into rapid serial production with plans to completely replace other weapons by 1870. The Chassepôt was issued as a direct replacement for minié style rifles to infantry regiments, while a less effective conversion of the standard minié rifles using the same 11mm paper cartridge, the Tabatière rifle, was given to second line units and the gendarmerie. The issue of the weapon was smooth because it did not represent the leap that metallic cartridges represented, and the French did not suffer some of the misteps the Americans had with the introduction of the .50-70 cartridge after the Civil War, or the English did in issuing their even more remarkable Snider in 1871. 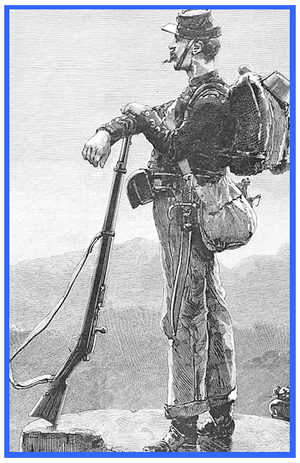 While inferior to these weapons on paper, the Chassepôt was much better than a muzzle loader, and the French logistic system, traditionally a frail entity, was able to put the new weapon into soldier's hands easily. Each Mle 1866 rifle was given a yataghan style short sword as a bayonet. These weapons were loved by the troops and feared by opponents - but the power of breech loading weapons and artillery made the Mle 1866 bayonet of limited usefulness. The Chassepôt rifle was issued to to a soldier with 83 rounds of ammunition, and soldiers were given 100 rounds of ammunition per year to practice with. Ammunition came to regiments in 1,440 round crates, with the ammunition packed into four large canvas sacks, each sack containing 60 paper wraps with 6-rounds. Company commanders were expected to assure that their soldiers expended at least half their ammunition ration on firing vollies with their unit in formation, and the other half was fired individually at targets up to 400 meters away. For field drills blank cartridges were provided, and each regiment held a stock of blanks for ceremonial duties. During the Franco Prussian war the French army was outnumbered by the German's massive military, and outgunned by Krupp artillery, Chassepôt turned out to be German military units who engaged prepared French infantry formations without artillery support suffered huge casualties. The Dreyse was unable to be fired from the shoulder so German soldiers shot only in formation from the hip. Against the accurate fire of the Chassepôt German units would disintegrate, only the relative rarity of direct infantry to infantry actions without the support of German Krupp guns kept the different qualities of the weapons from significantly effecting the war. As it was German casualties were higher that they needed to be considering their other advantages, high enough to make most of the world's militaries sit up and notice that firepower was now a defining part of the battlefield. Several hundred-thousand Chassepôt rifles were captured by the German military. Most of these rifles were converted to fire metalic cartridge and sold on the commercial market, or simply sold. Hunters and farmer hand-made their paper cartridges for the weapon, making it much cheaper to shoot than the new metallic cartridges. The Fusil Mle 1874 "Gras"
By 1871 both the American army and the British army had adopted centerfire metallic cartridge rifles (2). Metalic cartridges did not require rubber gaskets because the metal contained the expanding gas, were quicker to load than paper cartridges, were resistant to poor weather and immersion in water, but were more expensive to produce. The Germans were quick to respond with their own infanterie-gewehr 71 and the 11mm Mauser cartridge but the massive numbers required for their army (which was the largest in the world at the time aside from the Russian Empire) assured that it would be years before they would be in the hands of the entire military organization. The French with their own financial difficulties after the collapse of the Empire, the Paris Commune, and the huge post war indemnification still had a significant advantage in the Chassepôt. The design of the Chassepôt needed only to have a small change to the bolt head and a modification of the barrel (or sometimes a new barrel) to convert the weapon to use centerfire cartridges. At the same time the manufacturing process to create new cartridge rifles was already in place. Basile Gras, a French engineering officer, was able to develop both the new rifle and the process to convert older Chassepôt's to the new standard. The resulting rifle was called the Fusil Mle 1874. The converted rifles were known as Mle 1866/74 but were so similar that this terminology was rarely used. In honor of the designer the rifle was called the Gras. The Gras rifle gave the French a weapon that was functionally equivilant to the Mauser 1871 but were available in large numbers very quickly. 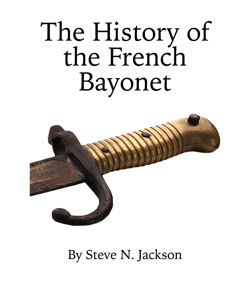 It was produced in four main variants, an infantry rifle, a cavalry carbine, a gendarmie carbine (which used a different bayonet, the older Mle 1866 curved bayonet), and an artillery musket. The Gras received an update in 1880 that was retroactively applied to all Mle 1874 and Mle 1866/74 weapons but the weapon was rapidly withdrawn from frontline Infantry service with the adoption of the Mle 1886 and the innovative Lebel cartridge. The carbine versions of the weapon remained in use longer, finally being replaced by the Berthier Mle 1890 and 1892 as they became available. The Gras and Chassepôt rifles were manufactured at all of the main French armories: Manufacture d'armes de Saint-Étienne, Manufacture d'armes de Châtellerault, Manufacture d'armes de Tulle, and Manufacture d'armes de Mutzig. Later weapons were produced by Steyr for export. In addition, thousands to tens of thousands of these weapons were produced in central asia from captured or purchased copies. Dozens of these weapons were captured by coalition forces during the Afghanistan conflict in 2001. Despite moving into second line use, the Gras was still held in huge quantities by the French and also equipped several other militaries. One of the most famous uses of the Gras was the Greek employment of these weapons against the Turks. The Greeks purchased 129,000 of these rifles starting in 1877. Using Steyr made Gras rifles the Greeks waged a successful unconventional campaign against the Ottoman empire. The 1874 was so important that the name Gras became a synonym for rifle in Greel. The rifle served past the Greco-Turkish War of 1897, and was used successfully in the Great War, and the Greco-Turkish War of 1919–1922. The last use of the Gras by the Greeks was during the German invasion of Greece and the later resistance. The Gras was strictly a second line weapon in the initial fighting but during the resistance Greek fighters were able to easily reload its black powder cartridges making it a key tool against the Germans. The liberation of Greece saw the weapon once again withdrawn from service, although for many years these weapons were prized possessions and would be carried in parades by former guerilla fighters. The Great War brought the Gras rifle out of retirement for the French. In its original 11mm calibre Gras rifles firing bullets with phosporus inserted into the base were used in to detroy observation baloons before machine guns were commonly mounted on airplanes. This was at best a temporary solution, but it was effective when it was used. The Gras though did not end with a specialized use as a baloon weapon. In 1914 the desperate situation with regard to weapons for second line soldiers lead to hundreds of thousands of Gras being converted to 8x50Rmm for use by railroad guards and Gendarme. 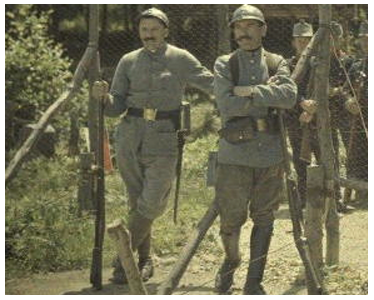 Right: Note the French border guards in 1916 armed with Gras rifles. By 1916 the Adrian helmet was widely enough issued to assure even border guards had them, while the pantaloon rouge was a distant memory. By 1916 many Gras rifles still in service had been modified to fire the 8x50R Lebel rifle cartridge. Above: French territorials in 1914 armed with unmodified Mle. 1874 Gras Rifles. Note the soft caps (later replaced by the Adrian helmet) and the pantaloon rouge, along with the standard Gras epee bayonet. The Fusil Mle. 1866 and 1874 is still occasionally available on the market, and ammunition is actually made for it in the United States. The weapon's strength and simple design mean that some of these weapons are shootable, but like all weapons this old firing one is a risky proposition. Before you shoot it you should have it carefully inspected by a qualified gunsmith. This is NOT your local firearm assembler who can throw together an M16 from a box of parts, but a trained machinist who can check the weapon for head spacing, cracks, and gas seal. Weapons converted to the r14 standard should never be fired with modern Lebel ammunition as they never received the 1927 "balle N" updates. Most Gras and Chassepot owners will more likely make an effort to preseve these weapons. They should be stored in locations of low and unvarying humidity. It is ok to oil old firearms, but limit their exposure to dust, which can destroy the weapon's finish. It is always useful to handle old firearms with cotton museum gloves. East C. (1877). The Armed Strength of France. W. Clowes and Sons. Mowbray, S. and Puleo, J. (2007). A Collector's Guide to Military Rifle Disassembly and Reassembly. Sherman, J. and Sherman N. (1996). A Passion for Cigars. Andrews and McMeel.